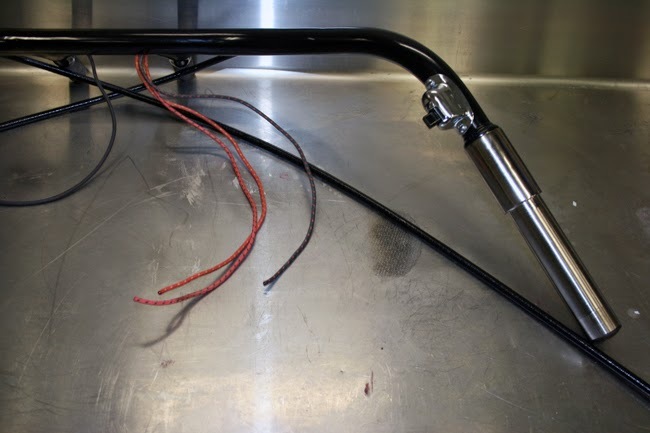 If you've never put together a set of vintage Harley-Davidson handlebars before, you'll be surprised by just how many parts are needed to complete the job. The control coil system which operates the throttle and spark advance are an ingenious set up, but have far more pieces than you would find in your typical modern throttle cable. Luckily, assembly is very straightforward and only takes a couple hand tools to complete. 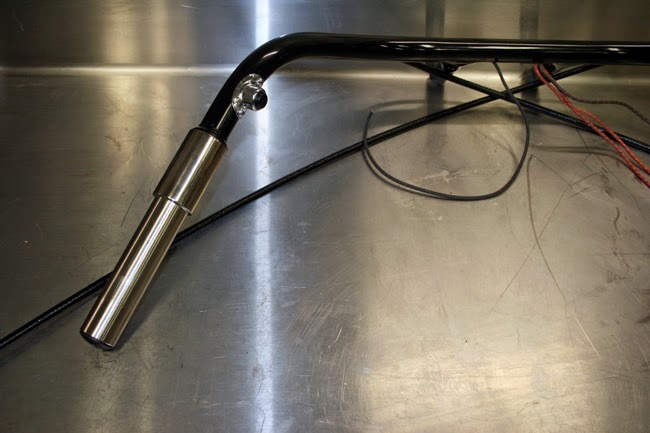 To start, I purchased a set of standard VL bars from Faber Cycle and then sent them to Carolina Custom Powder Coating to get a slick gloss black finish applied. 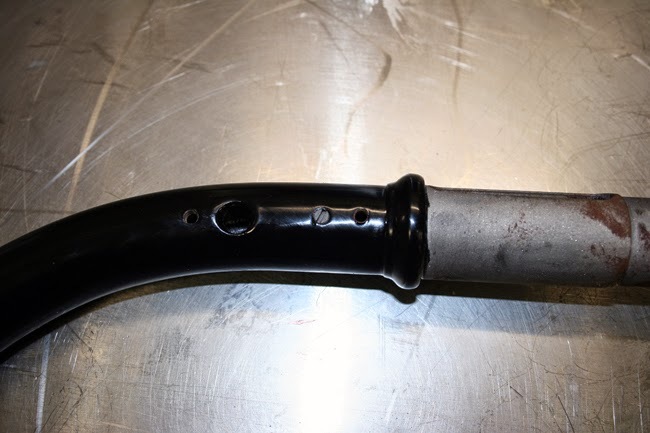 Whether you paint or powder coat your bars, make sure you tape off all the holes, insertion points into the front end and the end sections which are covered by the spirals. 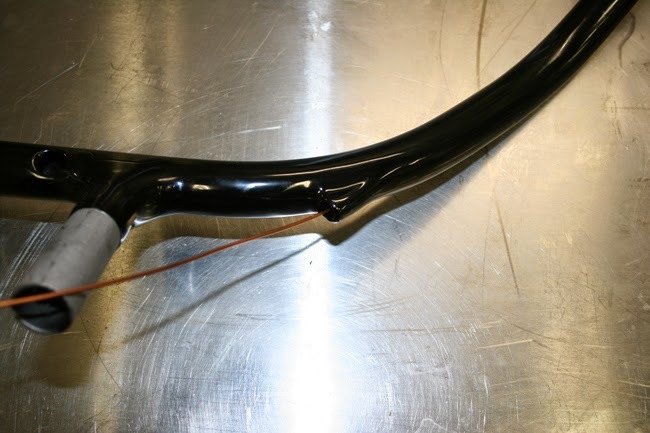 The first step is to secure the control coils inside the handlebars. The control coils are mounted inside the handlebars and exit through two holes located in the first bend of the bars. 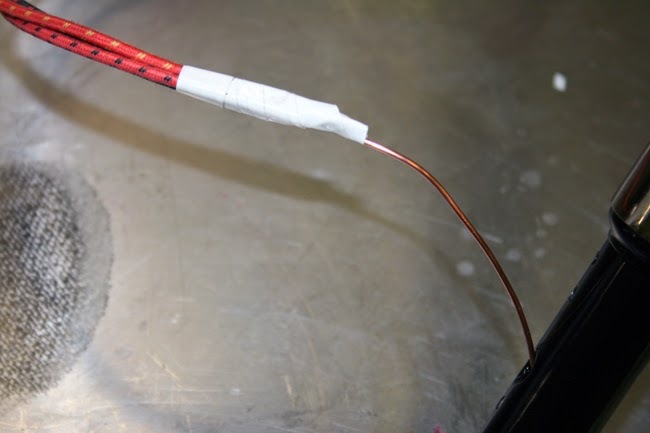 In the following photo, one of the holes is highlighted using a piece of copper wire. Note that the hole at the center of the bar is for the switch wiring, not the control coils. 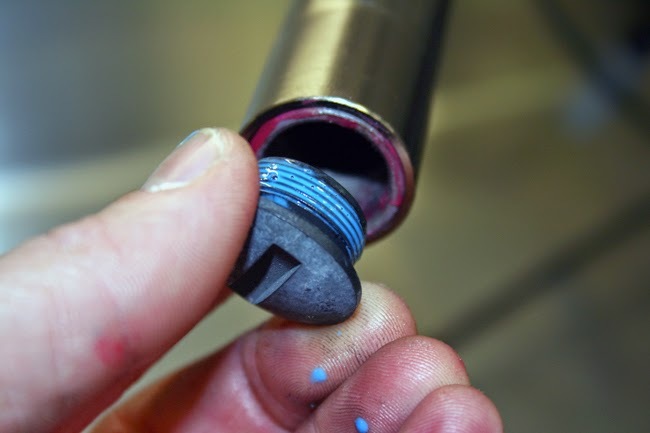 For installation, feed the control coils through these holes until they stick out of the ends of the handlebars. Then screw the handlebar plug onto the end of the control coil. 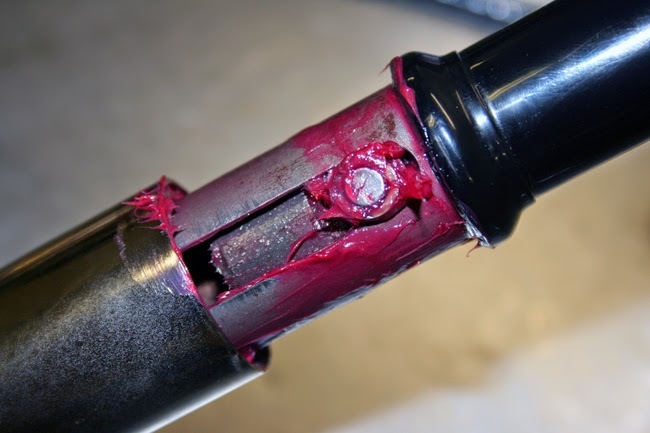 You may have to cut away the outer sheath if the metal inner core is not exposed. Pull the control coil back inside the handlebar until the handlebar plug is centered on the second threaded hole past where the spirals are mounted. 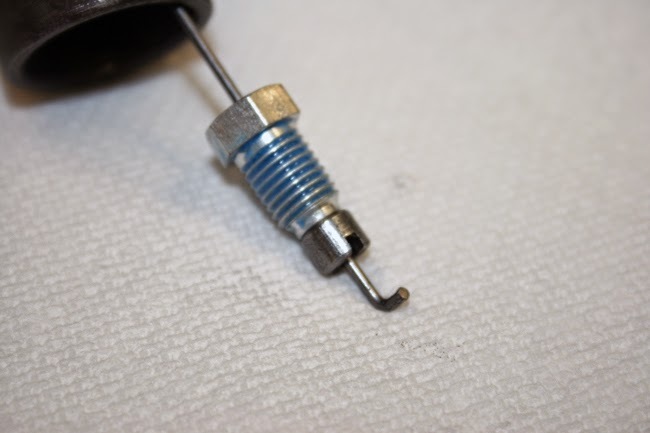 A small set screw threads through this hole and holds the control coil in place. I used a drop of blue Loctite on the set screw, just to make sure it stays put. 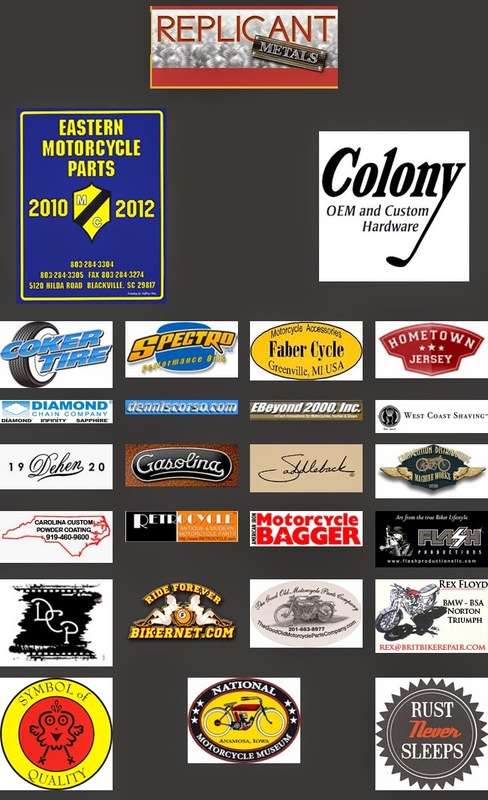 This is also a good time to lube the inside of the control coil with your favorite cable lube. I recommend PJ-1. 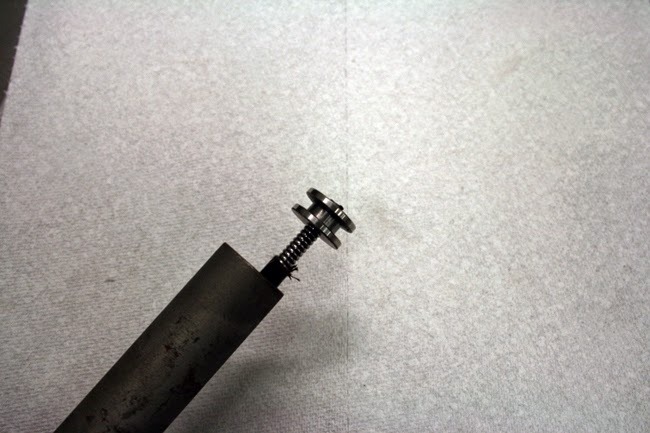 Now you can thread your control wire through the control coil, leaving plenty of wire sticking out the end so you can start assembling the plungers. Begin by threading the wire through the wire fastening screw and the control wire end. Then using a pair of pliers, put a 90 degree bend at the end of the control wire. You may need to carefully trim or file the wire so that it does not stick out past the control wire end. 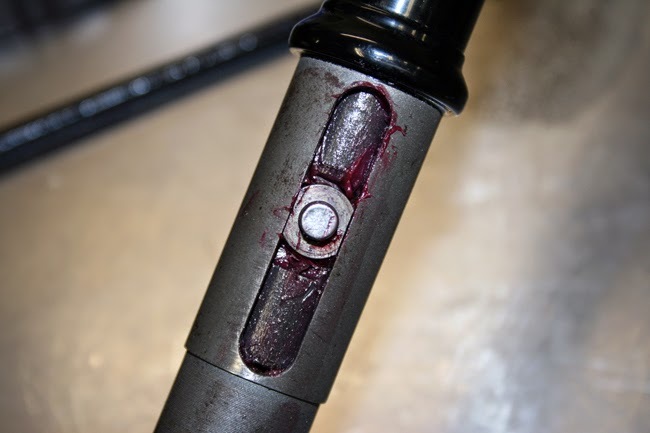 The wire fastening screw can now be screwed into the plunger and pushed inside the handlebar. You'll want to make sure that you use liberal amounts of grease on the plunger and inside the handlebar for smooth operation. Once the plunger as been slid inside the handlebar, line up the center hole on the plunger with the slot cut in the handlebar. A roller pin and roller block are used to keep the plunger lined up in the slot. 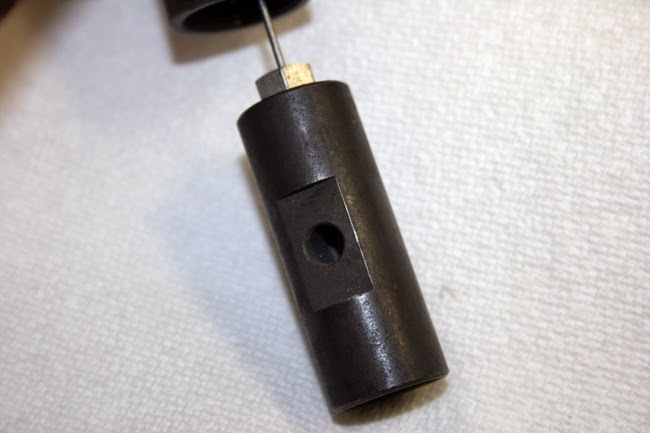 The final piece for the plunger is the plain roller which slides onto the roller pin. The plain roller tracks inside the groove cut on the internal surface of the spiral. As the spiral is twisted the plain roller moves the plunger back and forth inside the handlebar which in turn moves the control wire. The spiral can now be slid over the handlebar, making sure the the plain roller is inside the internal groove. Again, you'll want to use liberal amounts of grease. Any excess grease will force it's way out as you slide on the spiral and can be wiped away with a rag. 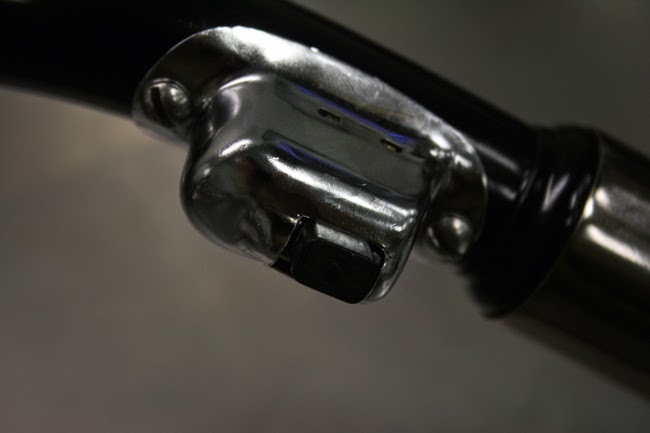 To keep the spiral in place, the handlebar end nut screws into the end of the handlebar. Moving on to the switches, there are only two on a set of VL bars. On the right is the hi-beam/low-beam switch and on the left is the horn switch. The wires for both of these run inside the handlebars and out through the large hold at the center. I threaded a piece of solid core 14 gauge copper wire through the handlebars and taped the ends of the switch wires to it before pulling it back through the handlebars. This is much easier than trying to feed the switch wires down the handlebars. Two screws fasten each switch to the handlebars. As always, a dab of Loctite is a good idea. Here's what your finished bars should look like. The grips and the front brake lever/cable will be added once the bars on mounted on the bike.